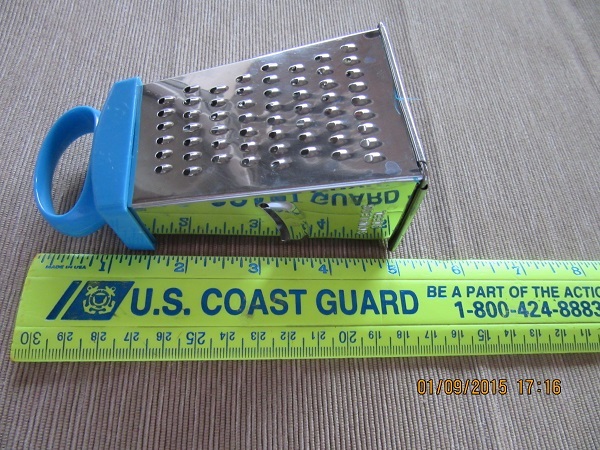 By far the “Gadget” I reach for most often is this little 5 inch mini grater. 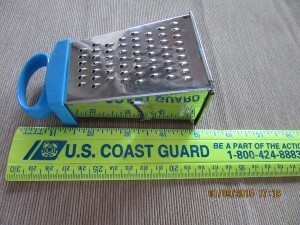 Until I acquired my tiny friend I would have to get out my big box grater to grate a tablespoon of carrots for a salad, or a couple teaspoons of onion for a salad dressing or even a small handful of cheddar to use in an omelet. I found myself saying “oh, you don’t need that carrot in your salad,” because then I’d have to wash the big grater and it wasn’t worth the effort. Have I told you I hate washing dishes? So, this little dickens has served to improve my diet, minimize the clean up and that makes me smile. I use it almost every day. Best dollar store bargain ever! And no, I am not recruiting for the US Coast Guard. Well, not yet anyway, but the day is young. However, I must say that they are a valued branch of the US Armed Forces!